Come gather round Dylan fans! 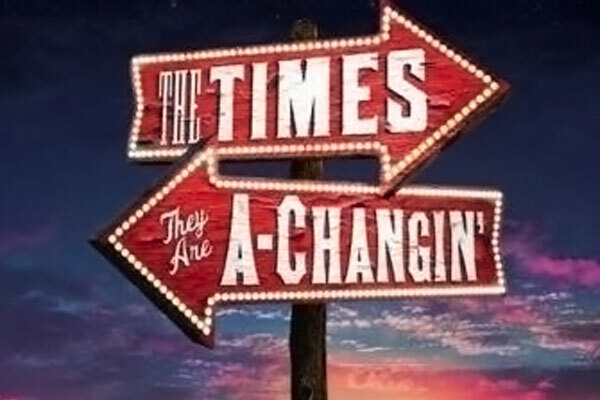 "The Times They Are A-Changin'" is a new Bob Dylan inspired circus playing at the Brooks Atkinson theatre on Broadway. A standing ovation greeted the performers at a packed preview performance on September 30. There was magic in the air from start to finish. The audience was more sedate at the beginning, but there was appreciative hootin' and hollering that grew. Eric Clapton made a surprise appearance as he was in The Big Apple for his concert tour. A spotlight shined on Clapton who was playing guitar with the theater company band in a balcony above the stage. I was dancing next to the stage and Clapton imitated my move! He had an amused facial expression and I'm sure mine matched his. Amazing how 30 seconds is likely to stay with me forever! "Times" will mainly attract Dylan fans as it strings together 26 back to back songs throughout the one hour and a half show. I think this play might also appeal to the poets and dreamers out there, but not to the theater-going set accustomed to a strong story line with the usual dialogue. The story line may be the weakest part of the show for those lacking a love for poetry. It is about a circus family and their personal struggles. There is no talking throughout the show, but the lyrics tell the story. The song selection is fabulous and spans Dylan's five decade career. It included some of my all-time favorites, such as "Just Like A Woman", "Desolation Row", "On A Night Like This", "Forever Young", "I'll be Your Baby Tonight", "Mr. Tambourine Man", "Blowing In The Wind", etc. I won't give them all away, but there wasn't a miss in the group. Twyla Tharp has choreographed a program of acrobatics and dancing that dazzles and breathes new life into deeply poetic lyrics that have withstood the test of time already. Kudos to the top three actors, Michael Arden, Thom Sesma and Caren Lyn Manuel. They had lovely voices and invoked emotion that was moving. Dylan has said publicly that he never imagined a play could capture the lyrics of his songs as this does. Let's face it, Dylan is at the top of his game considering his latest CD. Modern Times was released and skyrocketed to number one on the charts. He's one of the best songwriters of all time. May the "Times They Are A-Changin'" soon shake your windows and rattle your walls! This is a must-see for all Dylan fanatics. Even if you've never listened to Dylan, this is a stimulating entree into his varied song catalogue.